Irish Record 23lb 13oz taken on 17.09.2003 by Perry Dumay Kenmare Bay. The skin is extremely rough, designed to cope with the hard terrain this species prefers. The underside is light cream leading to tan flanks with large, dark spots, sometimes of leopard-skin appearance. Fish taken in and around kelp beds may be darker in colour. They have powerful jaws and several rows of sharp teeth. 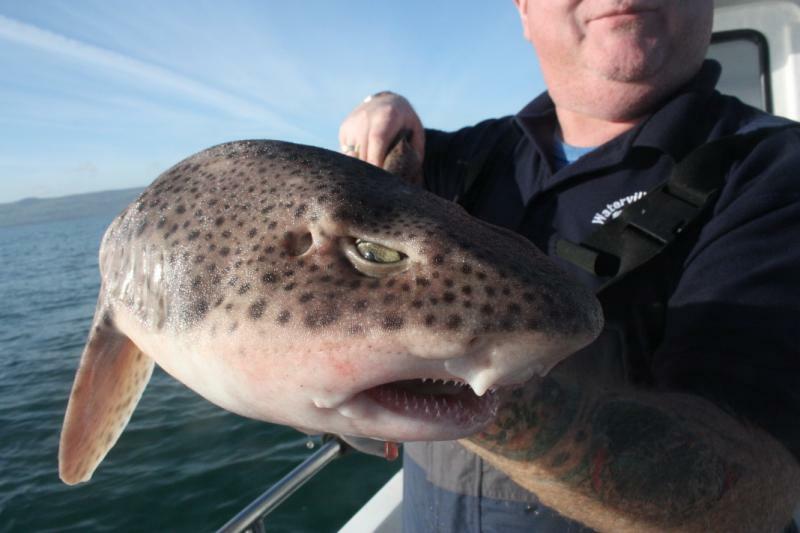 There is sometimes some confusion between this species and the Lesser Spotted Dogfish. Once you have caught a few of each, they are quite easy to differentiate. The immediate difference is in the nasal flaps in the mouth area. 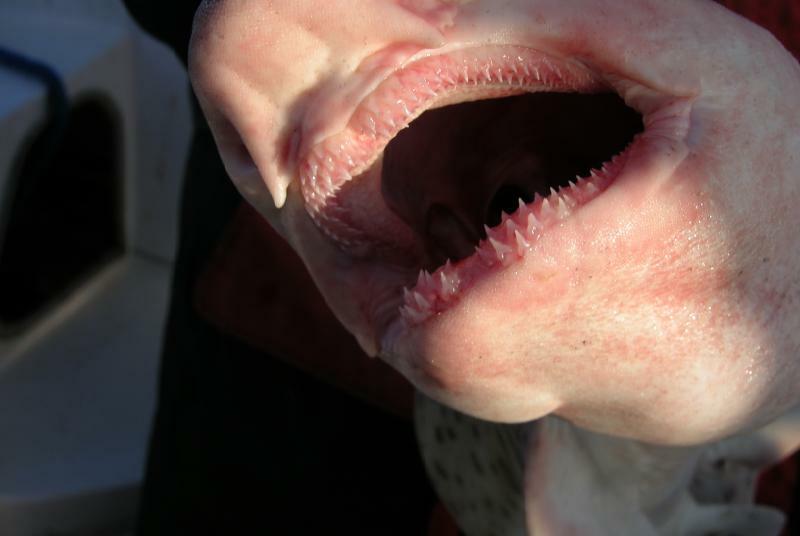 The nasal flaps on the Greater Spotted Dogfish are separate, whereas the Lesser Spotted Dogfish nasal flaps are linked to the mouth. Also known as Bull Huss, this species offers the angler a fabulous chance to tackle a large, hard fighting fish from the shore. Look for isolated rocky headlands with plenty of kelp beds and at least four metres of water within easy casting distance. 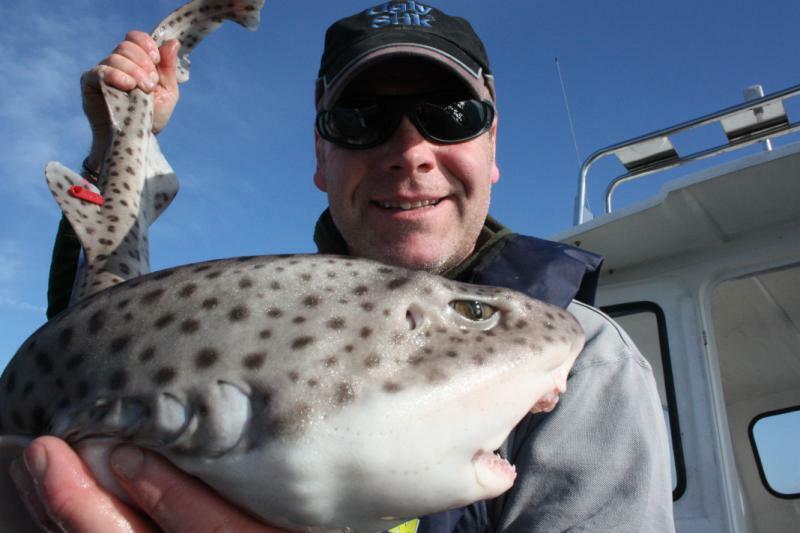 Huss prefer slightly quieter water just inshore of strong tidal runs and reefs. They hunt for bottom dwellers such as butterfish, gobies, Octopus and crustaceans but will scavenge on any dead fish carcasses they may find. Ramore head in Portrush on the North coast is an excellent venue for Huss, as are the rocks at Glenarm on the Antrim coast. 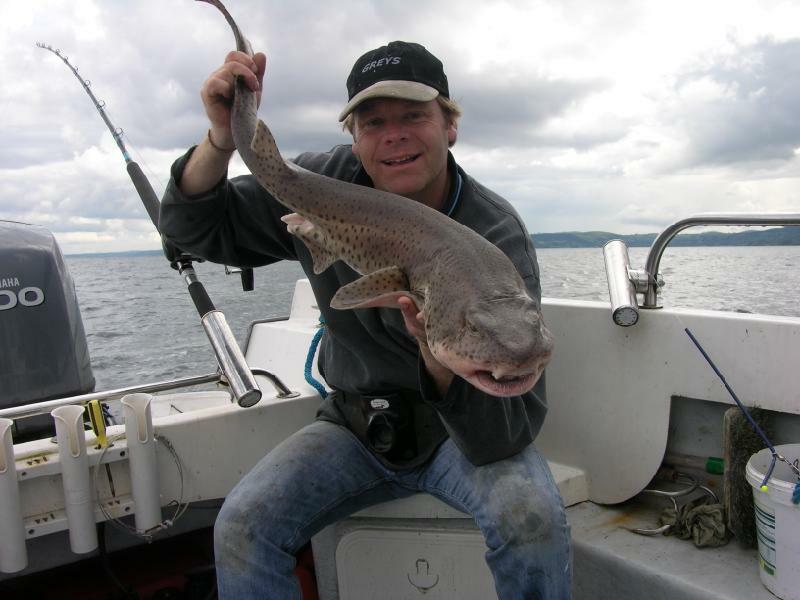 I have seen large fish taken just north of Ballycastle Harbour towards Kenbane Castle and inside of Fair Head. 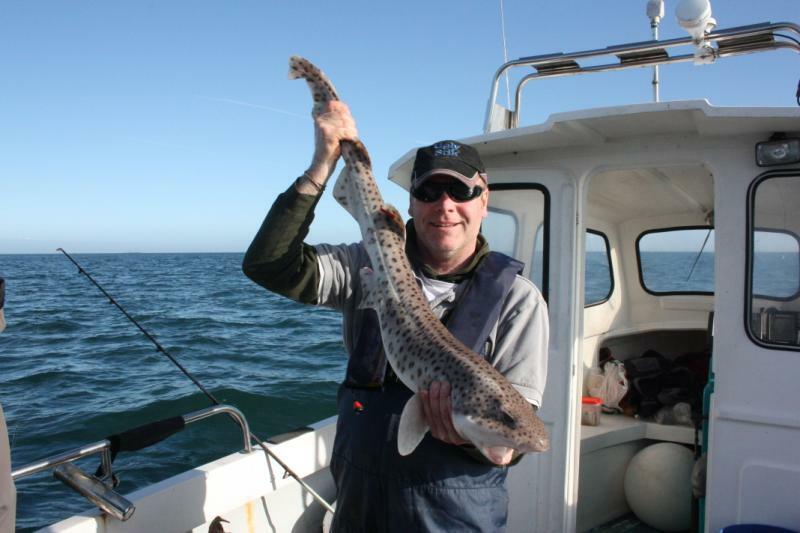 Red Bay and Carnlough produce specimen fish along with Rosslare and Kilmore Quay but anywhere along our rugged Irish coastline over rough ground is worth investigating. From Cork, Caherciveen and round to Dingle Bay in Kerry and particularly Kenmore Bay are notable areas for specimen Huss. 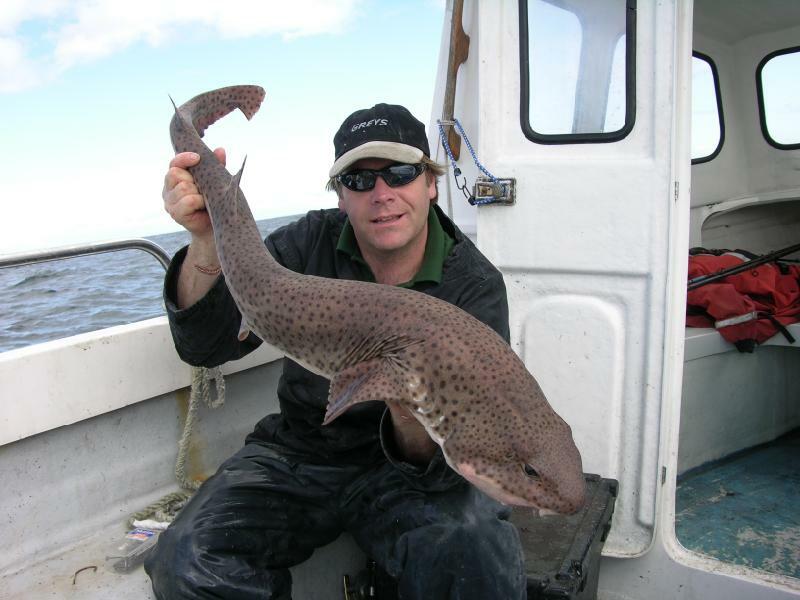 The Greater spotted Dogfish can be caught all year round from most of our coastline. 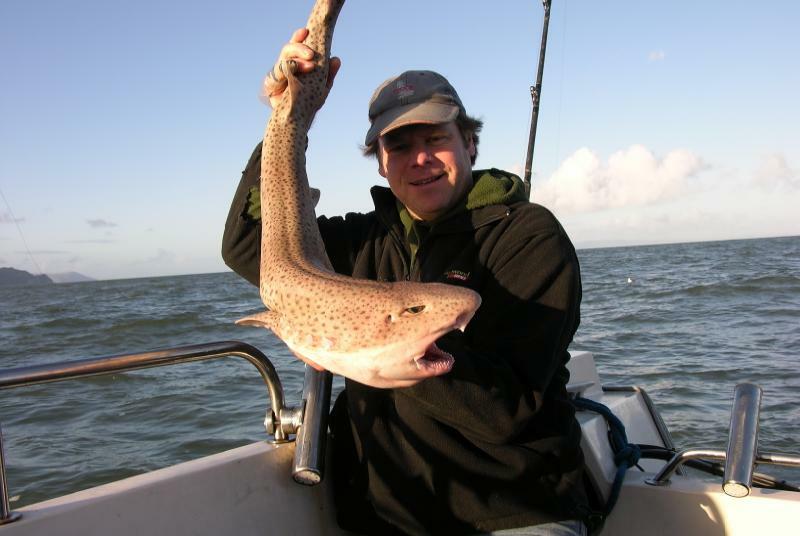 Many fish are taken from early summer through to autumn, but the winter months also produce Huss. 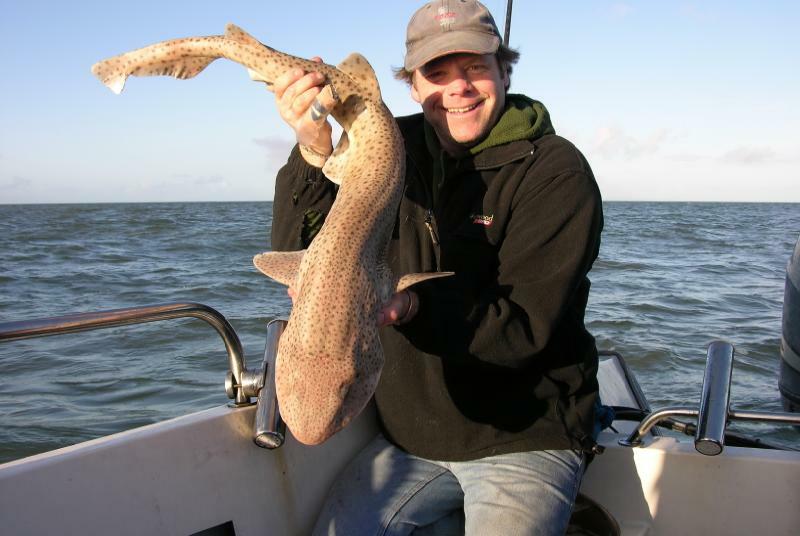 It may simply be the fact that less off-shore angling is carried out during the poor weather conditions through winter. Bulky fish baits are best. Mackerel, Herring, Launce, Whiting and Squid are ideal. If possible use any small fish caught in the same area such as fresh Pouting, as these are a natural prey for Bull Huss and work exceptionally well. I had a great day on one occasion out of Carnlough, landing fourteen Huss to double figures on oily Rainbow Trout fillets, including a twenty pound Conger and an eight pound Cod! Tackle and Rigs should suit the area being fished, bearing in mind possible strong tidal flows and the snaggy, rough-ground habitat that Huss prefer. Pulley Rigs coupled with rotten bottom lead links are ideal when casting from the shore. 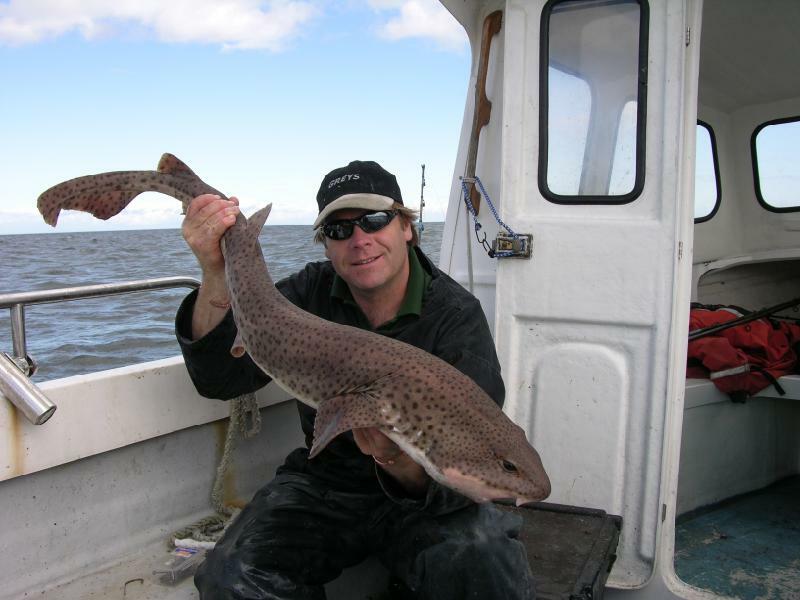 Hook lengths should be strong as the chance of a decent Conger Eel is always a possibility. From a boat, both paternoster and flowing trace rigs work well, or why not combine the two, using a short flowing trace with a snood twenty inches above. Hooks need to be sized according to bait size, but 4/0-6/0 heavy wire gauge and extremely sharp. Many Huss are lost on the surface as the fish uses its rows of razor-sharp teeth to hang on to the bait, letting go at the last minute!